Yes, there's the iPad but it's a different Apple "pad" product that grabbed my attention. This morning, I received this morning a package from Honk-Kong with this curious gamepad that was designed for the Pippin, a console/multimedia platform designed by Apple and produced by Bandai back in 1995. Pippin was actually derived from the second generation of Power Macintosh computers. It was unfortunately a failure. Two front mounted orange select buttons designed to replicate the features of a computer mouse. 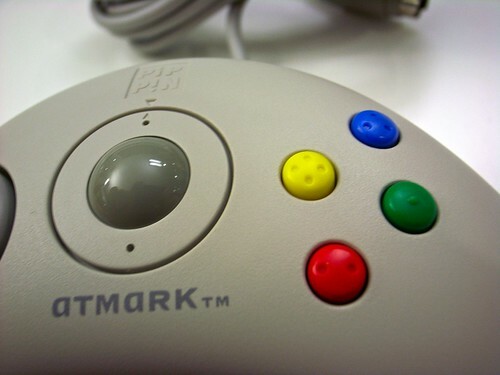 Apart from that it's quite common: boomerang-shaped, direction-pad on the left and four action buttons "laid out in the classic Super Nintendo diamond design + the button colors are a match for the PAL SNES controller" as pointed out here. What's maybe relevant in terms of design is the button shape with tiny braille-like dots to indicate the user which one he/she is using without looking at it. 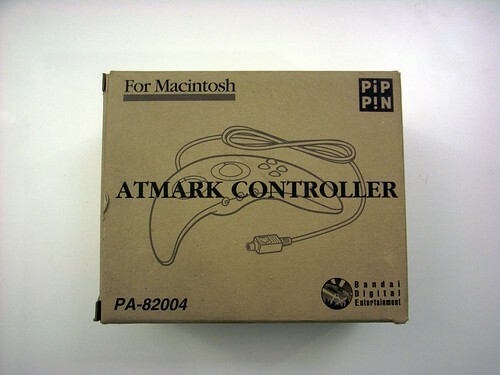 Another curious aspect is the fact that the Applejack controller was sold with a floppy disk that contains the "Applejack Software Developer's Kit" for editing the `pippin mapping resource, and an Applejack 2.2.0 system extension file. Which means that you could customize the `pipp' mapping resource of the Applejack input device drivers. Why do I blog this? this pad goes straight into the collection/project about gamepad evolution. 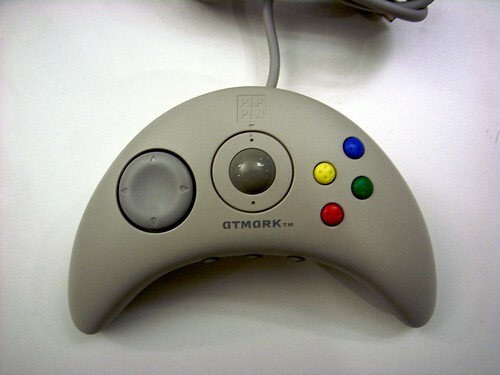 Although it was a failure, it's definitely an interesting artifact that tried to innovate (trackball!) and its "boomerang" shaped was also the one Sony showed as an early version of the PS3 controller. A sort of evolutionary dead-end to some extent because of the trackball.